The team's efforts will begin on Wednesday, with astronomers observing the asteroid, which is currently speeding away from our Solar System, across four different radio frequency bands. The first set of observations at the Robert C Byrd Green Bank Telescope in West Virginia is due to last for 10 hours. Previous observations of the object, called 'Oumuamua, have noted its strange, elongated shape, making it look a bit like a cigar. Mr Milner's Breakthrough Listen programme released a statement which read: "Researchers working on long-distance space transportation have previously suggested that a cigar or needle shape is the most likely architecture for an interstellar spacecraft, since this would minimise friction and damage from interstellar gas and dust." 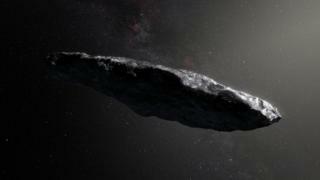 Andrew Siemion, director of the Berkeley SETI Research Center, who is part of the initiative, said: "'Oumuamua's presence within our Solar System affords Breakthrough Listen an opportunity to reach unprecedented sensitivities to possible artificial transmitters and demonstrate our ability to track nearby, fast-moving objects." He added: "Whether this object turns out to be artificial or natural, it's a great target for Listen." Prof Andrew Coates, from UCL's Mullard Space Science Laboratory in Dorking, who is not involved with Breakthrough Listen, told BBC Surrey radio: "I believe there is an experiment being done to actually listen to this object to see if there are any potential signs of life on it. "I think this is most unlikely because it's left over from the beginning of that planetary system elsewhere. Much better ways of looking for life are actually missions like our ExoMars project, which is going to be going to Mars in 2020, drilling underneath the surface to look for signs of life. We're building the camera system for that." He added: "But as this thing is passing through very quickly, why not have a listen just in case. But I think it's most unlikely." Other researchers who have carried out observations of the asteroid with ground telescopes say that, apart from its shape, it closely resembles natural objects found in the outer parts of our Solar System. It has a reddish colour, which is often indicative of organic compounds that have been irradiated by cosmic rays. Measurements suggest it has a dense structure and is comprised of rock and metal, but with little - if any - water-ice. Although 'Oumuamua formed around another star, scientists think it could have been wandering through the Milky Way, unattached to any star system, for hundreds of millions of years before its chance encounter with our Solar System. The asteroid's name, 'Oumuamua, means "a messenger from afar arriving first" in Hawaiian.